In addition to the list below, Bloco Toys' Marine Creatures Bloco Construction Set is also a winner of a 2009 TDmonthly Top Toy Award. To see the complete list of Fall 2009 winners, click here. Winner of a 2009 TDmonthly Top Toy Award! 2009 Award Winner The Toy Insider Top Holiday Toys! Multi-activity, multi-color and multi-character train set with building blocks included so it is a 2 in 1 - classical building blocks and train play. Learn shapes, colors and characters. 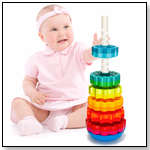 Develop motor skills. The pull along feature encourages children to walk. Tested to meet European and U.S. safety standards. Shains Bracelets are part of the Shains line of fashion accessories and an easy way to begin stylizing one's own fashion. Comes with the full alphabet and seven icons. Available in a variety of colors. Shains are cool, recycled fashion accessories that empower people of all ages to make their own statements — and change them anytime. "Shains are unique in using recycled materials and in their cool colors and new product selections, including unique ponytail holders and backpack keyclips," Owner Ewa Martinoff of Shainsware told TDmonthly. Launch date: 2008. This kit contains everything needle to make two cute stuffed owls, right down to the stuffing, scissors and needle. The owl pattern is printed onto unbleached cotton fabric, making it easy to cut out and simple to sew together the owls. The box is printed on the inside to cut it out and recycle it into glasses for your owl. Launch date: January 2, 2009. After rolling the special dice and flipping the timer, players race to list words containing the three letters shown on the dice. Only words listed by a single player score points, so players are rewarded for their speed and creative thinking. 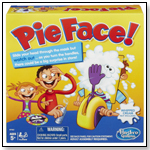 This game is adjustable for different skill levels and ideal for varied group sizes. Launch date: April 2009. Gobblet Gobblers utilizes the awesome strategy of Gobblet and adds personality and character to the game. Players pick their Gobblers family and line up three in a row to win the game. The Gobblers have a strong appetite and can gobble up smaller Gobblers. These cute little characters will test strategy and stimulate memory. The all-wooden game has a bright, distinctive design and is earth friendly. "We plant two trees for every tree used in creating our games," Adeline Bertrix, sales manager for Blue Orange Games, told TDmonthly. Awards: TDmonthly Top Toy 2009. Launch date: February 15, 2009. MOOV is a full-size construction toy designed so that children can construct MOOV by themselves without the use of any tools or help from their parents. The wooden parts, rings, shafts and frames are multifunctional. The spare parts in the wood are specially designed so it's easy to remove the rings from the shafts. MOOV has received the following awards: TDmonthly Top Toy 2009; Toy of the Year, 2008, The Netherlands; Honorable mention, Reddot Design Award, 2008 (International Design Award); Toy of the Year, 2008, Germany; and Right Start Award, Toy Awards, 2008, United Kingdom. Launch date: June 2009. LaQ Imaginal Flower by LaQ USA, Inc.
Other products from LaQ USA, Inc. Girls can make their own bracelets, hair ornaments and flower bouquets with fun snapping blocks in pretty pastel colors. The 260-piece Hobby Kit Flower comes with an instruction guide to make 12 interchangeable models from seven types of blocks. "LaQ is an innovative construction toy block with a patent for the cleverly angled block pieces which allow a child to create flat, two-dimensional, three-dimensional, and spherical objects from just seven types of blocks! The infinite possibilities of creating geometrical shapes through play is highly educational and enjoyable for children and adults," Mo Saeki, manager, overseas division, Yoshiritsu Co., told TDmonthly. Launch date: December 2009. — "I love these craft kits because the materials used are so incredible. Kids get to play with 100-percent wool felt, glass and wood beads, and beautiful handmade paper. It’s an added bonus that the company has skipped excessive packaging and uses 100-percent post-consumer waste recycled paper, reusable bags and vegetable-based inks," said Autumn Orndorff, gift buyer for Changing Hands Bookstore in Tempe, Ariz., after discovering Artterro kits at ASTRA Marketplace 2009. The ZipBin® Airport looks like an airport hangar and when unzipped, reveals an operating airport with runway, control tower, heliport and hanger. When play is done, capture all the toys inside. This play set includes a die cast, propellered plane. Calculated chances and strategic choices will place the odds in favor of players as they let the five dice roll them to a win with Yamslam. After each roll, a player chooses the dice that will get the best combination. Each combination is worth a different value and has only four chips, so it's important to take the best ones before they run out. Players race to get special bonuses before their friends do, keeping the suspense rolling until the end. The game has appeal for all ages and is convenient for travel, as it is "self contained in a beautiful tin box," Adeline Bertrix, sales manager for Blue Orange Games, told TDmonthly. Launch date: February 15, 2009. Awards: Dr. Toy's 100 Best Children's Products 2009; 2012 TDmonthly Top Toy Award. Why it won: This dice-rolling game from Blue Orange is fun for both kids and adults. With each roll of the dice players must strategize how they can win the chip with the highest point value. Without even realizing it, kids are learning basic math skills like addition and probability. The game is self-contained in a red tin, making it easy to play on the road or tote along to a party. — Yamslam is on the best-seller list at Golden Apple Learning Store in Pleasanton, Calif., Owner John MacDougall told TDmonthly in summer 2009. — "Right now, a game called Yamslam is our best-selling game," said Sue Banducci of Games Unlimited in Danville, Calif., in late 2009. She was anticipating sales of about 250 units during December. — Three of 38 retailers cited Yamslam as a best-selling game in Feb. 2010. Tatutina Birthday Medal by TATUTINA INC.
Other products from TATUTINA INC. 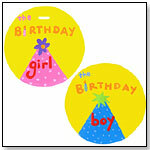 These fun wooden medals celebrate children's everyday achievements. Each medal comes with matching ribbon with Velcro at the top. The backside has a space for the child's name and date. Launch date: January 2009. Cory Caterpillar by HABA USA/HABERMAASS CORP. The 12”-long, three-piece body has lopsided wheels that happily waggle the caterpillar across the floor. With a smiling, friendly caterpillar face, the product features sturdy beechwood construction with non-toxic, water-based, lead-free stains. Launch date: 2009. This kit includes printed cotton canvas, a doll pattern, scissors, needle, thread and stuffing so that kids can make their own dolly. Awards: TDmonthly Top Toy 2009. “Meltdown” has 12 original, groovy songs for children by award-winning singer-songwriter Lanny Sherwin. The songs are created to be positive, funny and thought-provoking, and each comes backed by Lanny Sherwin's personal motto: “Don’t Drive Parents Crazy!” Launch date: July 12, 2009. Backseat Drawing is fun for the whole family. Players race to identify what the artist is drawing. But, the artist doesn’t know what he or she is drawing; the artist can only follow the instructions given by the director. The excitement continues as players attempt to follow directions and guess what the picture might be. Launch date: 2009. Offering peace of mind for the parent and health for the environment, Seedlings dolls are made without harsh chemicals and use natural fibers for all of their surfaces and clothing. Even the boxes are made of recycled material. The family consists of Ivy, Baby Blossoms, Willow and others. Baby Blossoms received a 2009 TDmonthly Top Toy Award. Amazing Baby™ Pop-Up Activity Ball by KIDS PREFERRED INC. This 6" sphere features a reflective mirror, pullout bear, ribbon tags, chime, crinkle, flaps and rings, set amid bold patterns and several textures. Launch date: April 2009. · What Is an Eco-Friendly Baby Toy?